There will be a Dudley Vision Advisory Task Force Meeting at 6:00 p.m. at the Bolling Building Community Room, Thursday, May 28, 2015. There will be no meeting this evening, Thursday, April 28, 2015, of the Dudley Vision Advisory Task Force. The next meeting is scheduled for May 28, 2015. More details will follow as we get closer to the date. There will be a regular meeting of the Dudley Vision Advisory Task Force on Thursday, March 26, 2015. 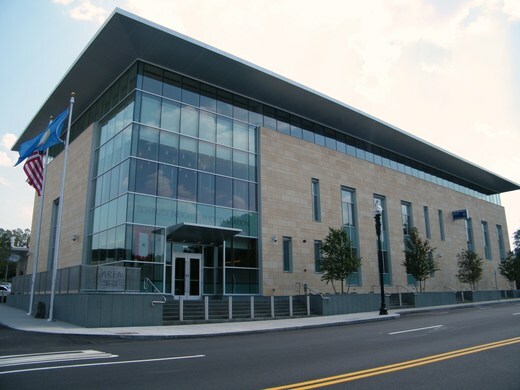 The meeting is scheduled to commence at 6:00 p.m. and adjourn at 7:30 p.m., at the Community Room at the Area B-2 Police Station in Dudley Square, 2400 Washington Street, Roxbury. An announcement has been made that the February 26, 2015 Dudley Vision Advisory Task Force has been cancelled. The next meeting is tentatively scheduled for Thursday, March 26, 2015, at 6:00 p.m., at the Community Room of the Central Boston Elder Services Building, 2315 Washington Street, Roxbury. BOSTON — Today Mayor Martin J. Walsh announced the City of Boston has selected The Venture Café Foundation to operate the Roxbury Innovation Center in the new Bruce C. Bolling Municipal Building in Dudley Square. The approximately 3,000-square-foot Center will be located in the new headquarters of the Boston Public Schools (BPS), and aims to encourage collaboration, bold thinking, and new business development. In addition, Mayor Walsh announced that SkyLab has been selected to provide community-connected programming services in the Bolling Building’s common areas, and to collaborate with the City, Boston Public Schools, and Venture Café Foundation to help fulfill the vision of the Roxbury Innovation Center. Through partnership with the Patrick Administration, the Massachusetts Technology Collaborative has committed to provide awardees grant funding totaling up to $150,000 to support the operation of the Center and programming in the building. “We’re looking forward to working with the community to create a space for experimentation and conversation that highlights all of the innovation and entrepreneurship happening locally, and connects to resources that make ideas and businesses grow faster,” said Kevin Wiant, Executive Director of the Venture Café. “Our vision is about connecting people, so that every person with an idea can build it, grow it, become a successful entrepreneur,” said Nicole Fichera. “We are excited to collaborate with the Skylab team, the Boston Public Schools, and many others to achieve this vision.” Fichera manages District Hall for the Venture Café, and is a co-principal with Wiant on the Roxbury project. The Venture Café Foundation connects the innovation community by operating spaces (including District Hall in Boston’s Innovation District and the Venture Café event in Cambridge’s Kendall Square), programs and conversations. The organization has extensive experience managing these types of facilities and engaging the greater Boston innovation community with programs. Their proposal envisioned operating the Roxbury Innovation Center with a “platform approach,” making the space a flexible and supportive space for many different groups across every industry. SkyLab is represented by Roxbury community members and members of local tech and entrepreneurial networks. The company envisions using the Bolling Building’s common spaces as locations to provide educational sessions in addition to hackathons, pitch contests, technology competitions, and events with BPS administrators, teachers, and parents. The company’s principals have been committed to connecting the local community to the Bolling Building since before construction on the facility began. Mayor Walsh announced plans for the Roxbury Innovation Center during his Greater Boston Chamber of Commerce speech in April 2014. In July 2014, a Request for Interest, Ideas and Innovation (RFI) to gauge interest in the innovation community for programming the location was released and 16 Statements of Interest were received in response. information gathered from the RFI informed a Request for Proposals (RFP) that was released in November 2014 to seek out an operator for the Roxbury Innovation Center and a programmer for the building’s public space. The RFP submissions were reviewed by a Selection Committee comprised of: Melissa Dodd, Chief of Staff, Boston Public Schools; James Jennings, Professor of Urban and Environmental Policy and Planning, Tufts University; Ted Landsmark, Boston Redevelopment Authority, Board of Directors; Eric Nakajima, Assistant Secretary for Innovation Policy, Massachusetts Executive Office of Housing and Economic Development; and Keith Williams, Director, City of Boston, Small and Local Business Enterprise Department. Four proposals were submitted in response to the operator RFP, and four proposals were submitted in response to the programming RFP. 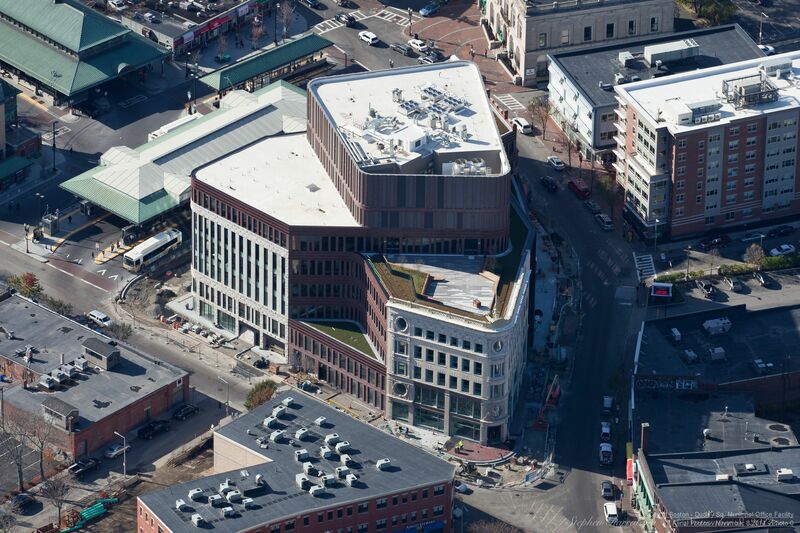 The Roxbury Innovation Center will be located on the second floor of the Bolling Building, which is slated to open in the first quarter of 2015. The initial lease will be for five years, with an option to renew for an additional five years. The Bruce C. Bolling Municipal Building is slated to open in the first quarter of 2015, and incorporates the Ferdinand Furniture Building, the Curtis Block and the Waterman & Sons building, into a new state-of-the-art facility. The six-story building will house an estimated 500 municipal employees from Boston Public Schools, and will feature office space, as well as open space for student work, school events, and community gatherings. The building will also include 18,000 square feet of street-level retail space, and the approximately 3,000-square-foot Roxbury Innovation Center. The City of Boston’s $115 million investment in the Bruce C. Bolling Municipal Building has spurred private investment across Dudley Square. The building is a collaboration between the City of Boston’s Property and Construction Management Department and the Boston Redevelopment Authority, working closely with the community and historic preservationists. 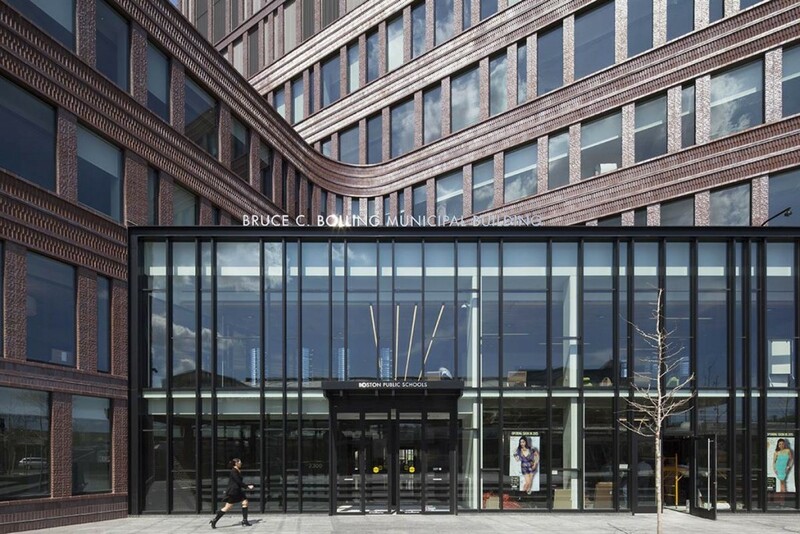 The Bruce C. Bolling Municipal Building was designed by Mecanoo architecten and Sasaki Associates. Shawmut Design and Construction served as the CM at-Risk builder, with project management services delivered by PMA Consultants. 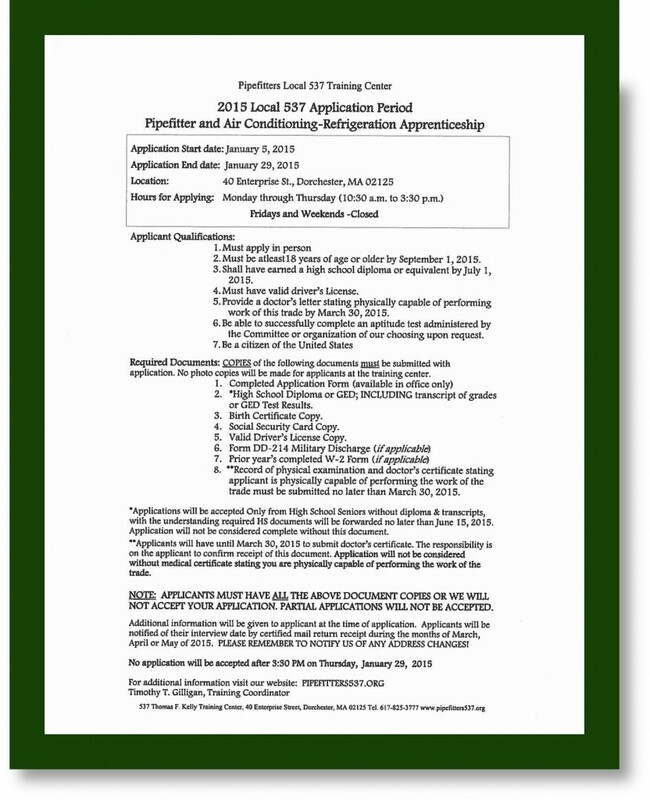 The Local 537 Pipefitters and Air Conditioning-Refrigeration trade union training center is announcing an opportunity for Apprenticeship applications.